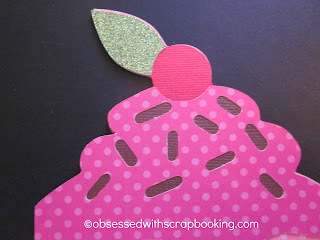 Obsessed with Scrapbooking: We all scream..
We all scream for....ice cream! 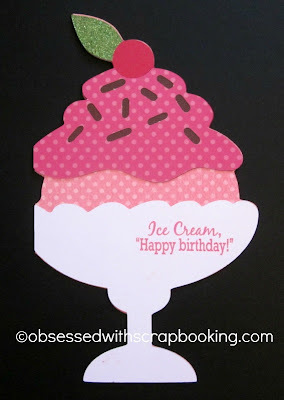 It's summer, it's hotter than hot outside and I thought this fun shaped ice cream sundae card would be perfect for this time of year. 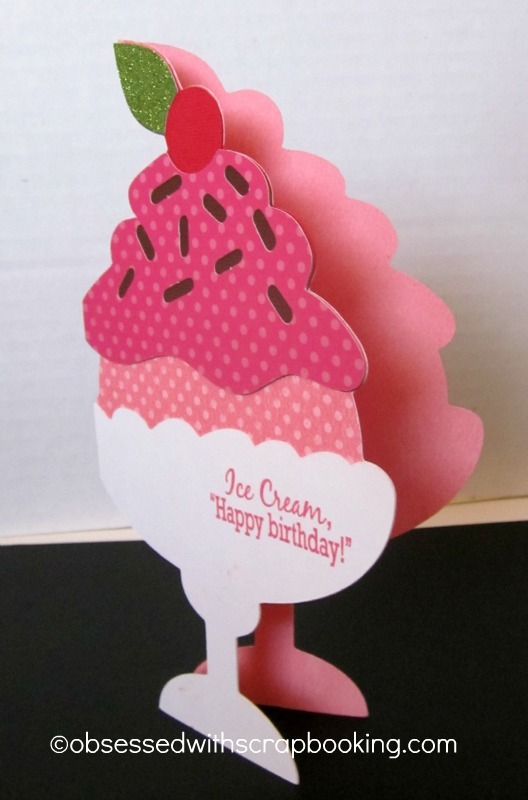 The Cricut Birthday Bash cartridge has some really cute shaped cards, including this ice cream sundae one, which I cut at 7" high. Above, I used green glitter paper for the leaf. Typically, I would have used red glitter paper for the cherry but that is actually a layer of the card and I worried about gluing a bunch of other layers on top of glitter paper. I intended to use my Stickles (glitter glue) to glitter the cherry. I am prone to smearing glitter glue so I usually wait until the end of the crafting session to add on the glitter glue so I can put the project up and away and it will be sure to stay pristine. Well, suffice it to say, I put the card away and kept crafting and forgot all about it. Whoops! A side view of the card. The stamp sentiment was perfect for the card and comes from the Joy's Life Yummy Puns stamp set, which is adorable! You can check it out HERE. Do you like shaped cards? Do you ever make them? I like them but I don't typically make odd shaped ones, such as the card above. I'm more of a scalloped circle, square, etc. shaped card girl. I've never made a shaped card but yours is so pretty. Nice work! Fun and yummy summer card. Love the colors. I loved your sundae-shaped card! I enjoy making some shapes, but usually, they end up being difficult to stand up, or fit an envelope. Doesn't stop me from trying though! Thanks for the inspiration. BethAnn M.
I like making shaped cards--they are so unique. Super cute ice cream card. I love your card! I have made a few shaped cards. I do not have a cart that has shaped cards so I weld my shapes together to make the card. thanks for sharing! Joy, I love your card it's got such fun dotted papers and great colors! I love shaped cards! To me, they are unique and fun in the hand-crafted (of sorts) world and so easy to do with my Cricut (Wild Card is my go-to, but Sweet Treats is one I tend to use for birthday fun!) TFS! Your card is just adorable. I mean Yummy! This is such a cute card! I ususally just do the regular A2 size cards but did make a shaped card yesterday using the coffee pot from From My Kitchen and Design Studio...loved it. Something I need to do more. Thanks for the inspiration! very cute and "sweet" card shape and I love that sentiment! I make shaped cards to send to our grandkids, but tend to keep to the square shape for all the others. You card is adorable & the sentiment is too! I like your Sundae card, great colors and looks like a lot of fun! I love shaped cards. I tend to make anything any shape. I love to make cards that weld together easy - shaped. But not so good on the ones that don't weld automatically. Great sundae card! I love shape cards and this one is adorable! Hey got any ideas for a male birthday card! What a fun card. I love that you you used sparkle paper also! I am so enjoying your blogs today! I love shape cards and don't do them enough. I have been seeing shaped cards on lots of the blogs and think I might give one a try. Your ice cream card inspired me! My birthday is in January and you can send this super cute card to me. I loved it. I do love shaped cards and have made a few. The last ones I made were for my granddaughter. I made a strawberry shaped card and a cute little chicken card. They turned out so cute. I usually think of the A2 sized rectangle shaped cards as my go to shape though. Oh, I can be so boring sometimes. Very cute card. Ice vream sundae works wonderfully as a shaped card. Cute card! I just ordered the Joy's Life Fall bundle.. It comes with all 4 new stamp sets...can't wait! Cute card and it makes me want some ice cream. Thanks for sharing,God bless. It seems to be a different card looking cute as well. good work keep it up.